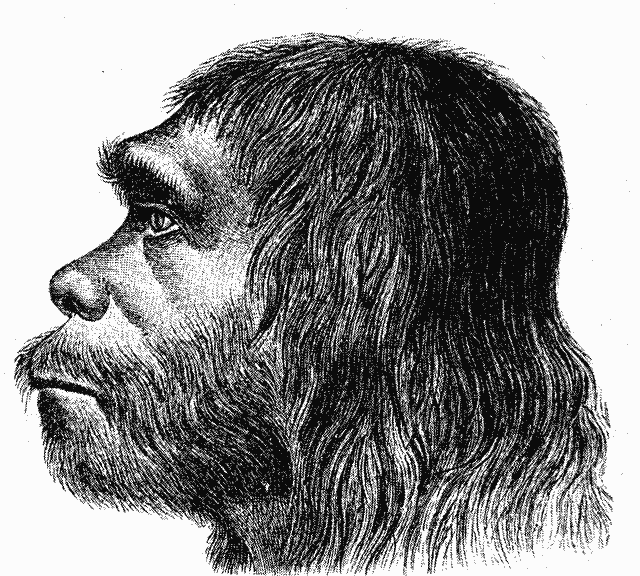 From Wikipedia: Neanderthals are an extinct species of the genus Homo, possibly a subspecies of Homo sapiens. They are closely related to modern humans, differing in DNA by only 0.3%, just twice the variability across contemporary humans. Remains left by Neanderthals include bones and stone tools, which are found from western Europe to central Asia. The species is named after Neandertal (“Neander’s Valley”), the location in Germany where it was first discovered. Neanderthals made advanced tools, had a language (the nature of which is debated) and lived in complex social groups. The Molodova archaeological site in eastern Ukraine suggests some Neanderthals built dwellings using animal bones. A building was made of mammoth skulls, jaws, tusks and leg bones, and had 25 hearths inside. While largely carnivorous, and apex predators; new studies indicate Neanderthals had cooked vegetables in their diet. In 2010, a U.S. researcher reported finding cooked vegetable matter in the teeth of a Neanderthal skull, contradicting the earlier belief they were exclusively (or almost exclusively) carnivorous and apex predators. Personality: Neanderthals tend to be peaceful and caring people. They will rarely war on others or make trouble, but they will finish it if they are evenly matched or have the upper hand. They tend to think things through, and they are not quick to anger. Both these leave them to be thought unintelligent, and simple people – even among other tribes of the same technological level. They are predators though and in hunting and war can be very vicious. They will rarely give quarter to enemies. Their outlook on life is pragmatic – live and let live, kill or be killed. Despite that they will avoid trouble when possible. Entire tribes will move away to avoid problems. Physical Description: They have short natural lives, with an upper limit of 50 years old. Both males and females reach puberty at a young age, eight to twelve years old though. Males average 65 inches tall and 171 pounds in weight, while females average 60 inches tall and 146 pounds in weight. Both will have shaggy unwashed hair adorned with bones, feathers, and colored stones. Males will have shaggy beards to match. They wear rough hide tunics or go fully naked. In cold weather foot wrappings and coats of fur will be worn. Society: Neanderthals live in tribes of 10-50 individuals, mostly extended family members who tend to pair off for life. Particularly heroic figures, and other aged members of the tribe will act as a ruling council, with the oldest member of the tribe the leader. All members of a tribe no matter age, participate in the hunt, preparing food, building shelter, and war. Tribes will make permanent villages near sources of food such as herds of large animals. They do eat vegetables, but as a supplement to their diet. They do not brew, farm, or raise animals, instead living off the land as foragers and hunters. Shelters will be made of the bones and skins of animals, and sometimes caves or piles of rocks. Neanderthal are masters of stone chipped tools, they have a wide variety of chipped tools for scraping and curing hides, cutting vegetation, and making weapons. Neanderthal art is basic, woven grasses, small stone statues, and bone, feather and sinew totems and necklaces. Neanderthal have the concept of trade, but it is mostly small items on an individual level. A father will trade his daughter to another tribe for one of their children. An especially skilled stone worker will trade tools or weapons for food. A tribe may trade one type of meat for another, for extra hides, or for stones they can chip. Otherwise most possessions that aren’t carried day to day are communal and can be used by anyone. Most of these will likely be left behind if the tribe moves. Hunting: The entire tribe funnels large animals into traps, either by driving them over a cliff side, or into a box canyon where they finish it off as fast as possible with spears. They try to only kill as many animals as needed, avoiding destroying entire herds if possible. They may also hunt especially dangerous predators that pose a threat, although they are just as likely to move the entire tribe to a safer location. Religion: The Neanderthal does not worship a god per say. They give thanks for their sacrifice to the souls of animals they kill for food, for enemies killed in battle, and tribal members who have died. Opponents in war are given the same burial rights as members of their own tribe, a basic burial away from camps and water sources without a marker of any sort. Neanderthals do rely on herbal and natural remedies to heal the injured and remove afflictions. They naturally live “with” nature and have a distrust of magic. Language: They have their own language that is straightforward and without metaphors or allusion. Nor does it have words to express feelings of hatred, revenge or envy. The are able to express simple emotions such as sadness and love. They have the ability to pickup guttural languages easily and are likely to learn Orc or Goblin before Common or Elvish. Alignment: Neanderthals tend towards Neutral Good, Chaotic Good, or True Neutral. Neanderthals do not naturally have the concept of Evil, selfishness, or laws outside those imposed by the tribe or nature. Any characters with these alignments are either mentally deranged or have suffered a life shattering event that has driven them over the edge into another alignment. Adventurers: Neanderthal adventurers are incredibly rare. Their natural isolationism and willingness to move to avoid trouble leave family groups relatively whole. An adventurer is likely to be the last remaining member of a tribe, attempting to find a mate or home with another tribe, or a lone hunter who has gotten lost. +2 Str,+2 Int,-2 Chr,+2 Con,+2 Hit Points. Neanderthals are stockier, stronger, and slightly smarter then humans. Neanderthal Land speed is 30 feet. They are not slowed when carrying a medium or heavy load. Unlike dwarves this does not include armor, they are still slowed by armor weights – if they can be convinced to wear it in the first place. Weapons: Neanderthals use Shortspears, Longspears, Stone Axes, slings, and stone daggers. They can use metal versions of these weapons, but are likely to drop them in favor of their own homemade stone versions as soon as possible. Masterwork and Magic Weapons: Any adult Neanderthal automatically makes masterwork stone weapons and tools. This takes 2D6 days per an item assuming the correct materials are on hand. At level five these become +1 weapons, at level ten, +2, +3 at level 15, and +4 at level 20. Armor is limited to crude hides and leathers, and will be indistinguishable from their day to day clothing. As for weapons, armor is masterwork by default, and gains a +1 bonus every five character levels if the character makes it themselves. This bonus can stack on top of exotic leathers to the maximum +5 bonus. +4 dodge bonus to Armor Class against all beasts and animals, size medium or larger. +4 saving throw Spell Resistance. Includes ALL magical affects, including supernatural, extraordinary, and even those cast by friendly characters. +4 savings throw against poison and disease. Favored Class: Barbarian. Neanderthals that have had contact with the “outside” world may also take Fighter, Druid, or Ranger as a multi-class only after they have at least two levels of barbarian, AND must have access to a teacher of some sort. Typically players would only come across a tribe of Neanderthals in a remote location. They will be treated indifferently unless the tribe is helped or threatened. Slavers have found a tribe of Neanderthals and have captured them. A few members were able to escape and are looking for help to rescue the rest of the tribe. The colored stones a tribe of Neanderthals wear in their hair turn out to be valuable gems. The PCs can be tasked to find the source of gems, or can try to protect the tribe before it is ruthlessly slaughtered by treasure seekers. A tribe has come across a powerful artifact that is slowly twisting their minds towards evil. The tribe has been attacking settlements nearby and the characters are tasked to take care of them. An frozen Neanderthal is found frozen in the Arctic. It is brought back to civilization but along the way unfreezes…. A tribe of Neanderthals are found in a remote area that is soon to be exploited for it’s natural resources (Minerals, oil, etc.) The Corporation is planning on simply wiping them out, but the head of the project has secretly contacted the characters to make the tribe quietly disappear to somewhere safe. An unscrupulous scientist is posing as a fertility doctor. He is implanting unsuspecting women with Neanderthal children without them knowing. A group of Neanderthals have been found. Zoos want to put them into captivity. Corporations want to exploit them. Scientists want to study them. Activists want to protect them. The characters can be asked by one or more of these groups to resolve the issue. The characters come across a previously hidden island “Lost World” style. To survive, they need to make friends with the natives, who just happen to be a tribe of Neanderthals. 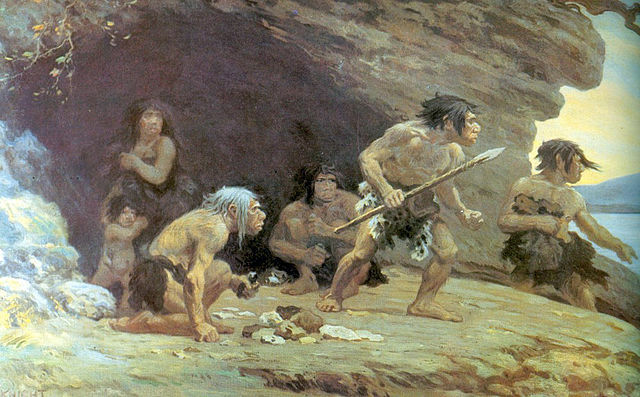 A corporation has decided to resurrect the Neanderthals to exploit them as cheap labor. Since they don’t fall under the definition of “human,” this has been determined as legal by the courts. Characters can be “guards” of the labor camp. Or hired to break the Neanderthals out. Neanderthals never went extinct. They simply left Earth to avoid the problems with humans. They have been found on another planet, with technology far advanced of humans and a racial grudge.